During his training at the Arts Academy of Düsseldorf, Albert Bierstadt engaged deeply with the spiritual and sensory tenets of German Romanticism. The movement, both intellectual and aesthetic, emphasized sublime or transcendent experience—a concept that lent itself well to depicting the American West. In landscapes like Indian Canoe, Bierstadt aimed to convey a sense of the divine through nature. The diminutive figure set amidst the vast sky and towering trees has no individual traits, and serves as a stand-in for the awing experience of the sublime. The sun setting behind a lone Indian may also be read as a signal of the looming decline of Native Americans’ traditional way of life. 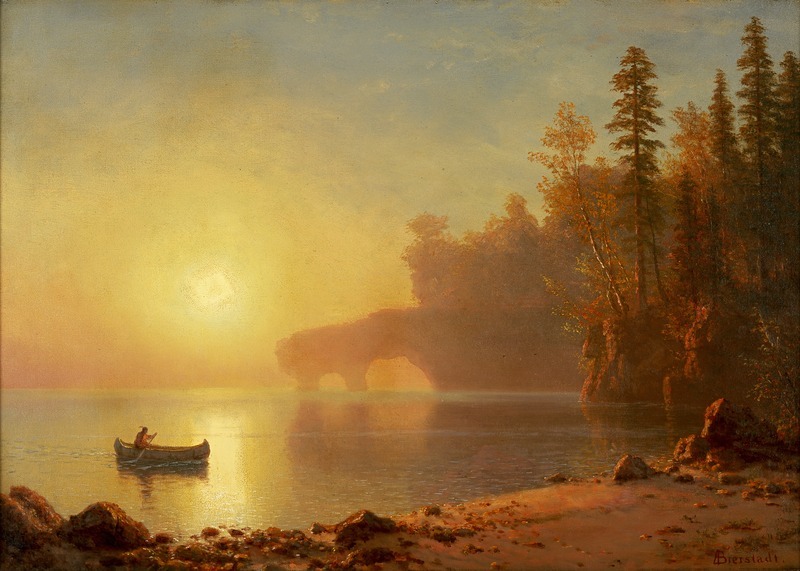 Albert Bierstadt, “Indian Canoe,” Blanton Museum of Art Collections, accessed April 26, 2019, http://utw10658.utweb.utexas.edu/items/show/2704.